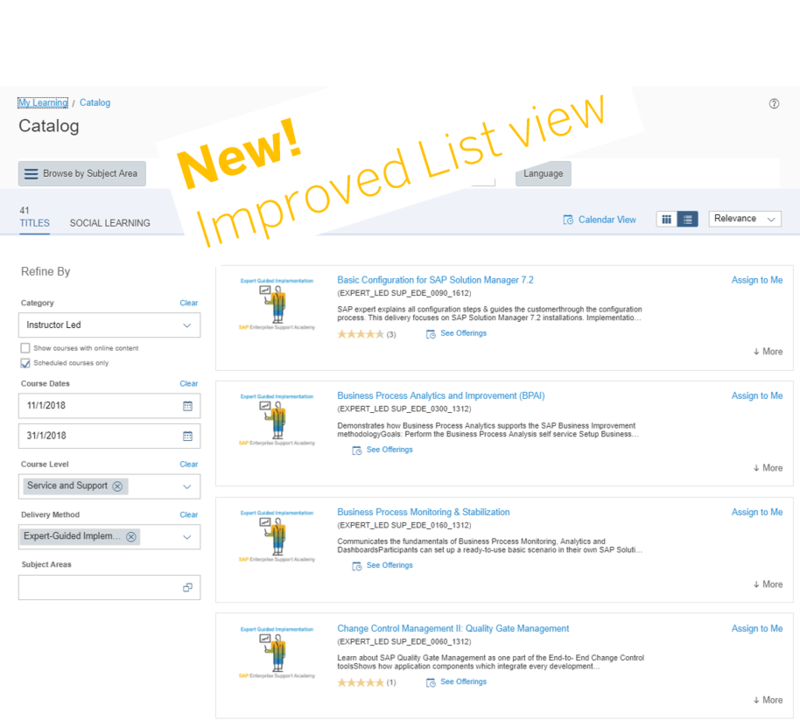 Heads-up − since January 10th the new design of the catalog pages is live in learning content space of SAP Learning Hub. The layout for the search results has been redesigned to offer a more intuitive and modernized experience. Each course item is presented as an information card with a description dropdown window and course code. No need to scroll down to adjust your filtering options – they are now available directly to the left of your top search results. 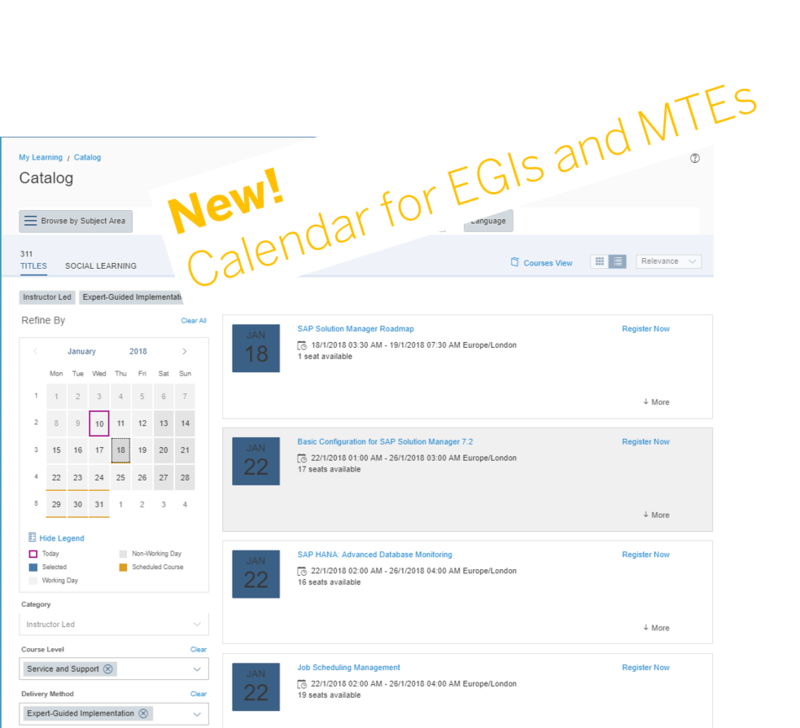 And … included in this update is a built-in calendar for the SAP Enterprise Support Academy’s scheduled offerings (MTE’s & EGI’s)! Top section: Search option by subject area or key word plus the option to change content language. Middle section: Rotating banner showing up to five courses. 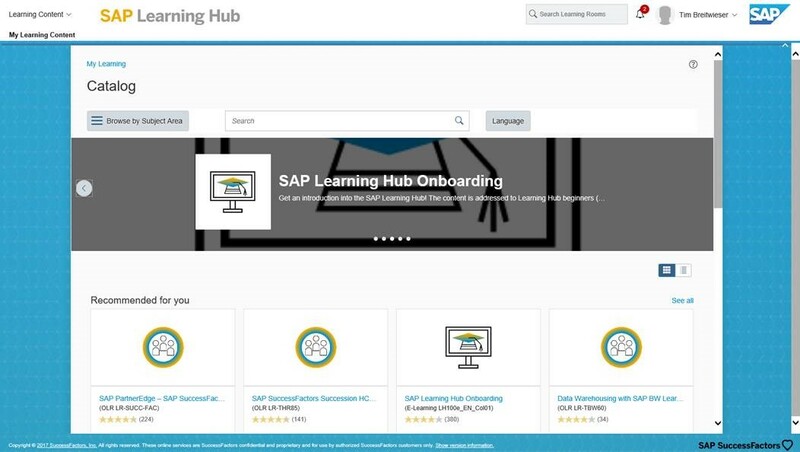 For the initial launch the Welcome Learning Room and the SAP Learning Hub Onboarding course are to be seen, as these assets are available in all editions and all catalogs. Bottom section: The three sub-sections show recommended, highly rated, and featured courses. Per sub-section one row is shown with up to four courses in card format to avoid the need for scrolling. There is a “See all” option by sub-section. The catalog result page provides a lighter visual of the search result. Courses are shown by default in card format and view can be changed to list format. Refinement options remain identical with category, course level, delivery method, and subject area. From here users can not only access the courses but also branch to a calendar view which show scheduled items. Visit the catalog (for registered users)!